Stars trail through the night sky above an unnamed slot side canyon off of Pictograph (Petroglyph) Canyon on the Montana and Wyoming boarder. 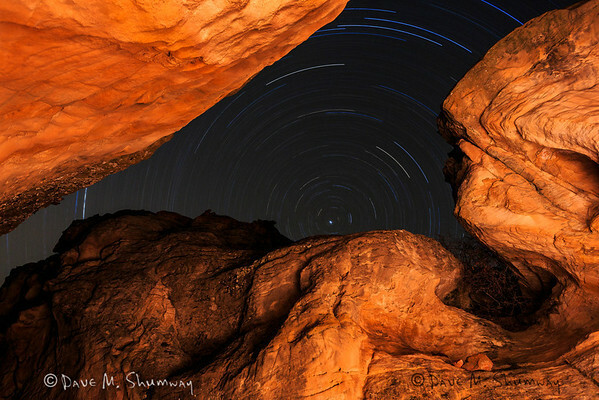 Captured with a Canon 5D III and 17-40/4.0L in bulb mode at ISO100, f/7.1, and 7,254 seconds. The camera was mounted on a Gitzo 3540XLS and Arca-Swiss Z1sp ball head, a Calumet Pro Series Intervalometer. Two students accompanied me on a trip to Pictograph (Petroglyph) Canyon, a remote canyon located down a poor two track road. We had attempted this trip once before, but uncooperative weather forced us to make a second trip. The weather was significantly dryer and warmer this go around and the sky was clear enough to see and photograph the stars each night. We lugged seven tripods, a six foot motorized timelapse dolly and roughly one hundred pounds of other camera and lighting gear in and out of the canyon multiple times, so that we could capture the beautiful scenes that we found before us. With the remote location of the canyon we chose to camp on the rim of the canyon, the better weather made for a significantly more pleasant camping experience for the students. The fun toy for tis trip was my brand new 5DIII, I literally unboxed it moments before leaving for the trip. Oh I also had just picked up my new Ford F150. My main goal for the trip was to test out the internal HDR functions of the 5DIII as well as to take the opportunity to test out the new camera on some long exposures. The internal HDR of the Canon 5DIII paired with my 6' Dynamic Perception Timelapse Dolly all but forced me to test out a +-3 stop HDR sunset timelapse in the canyon. The attempt showed that the internal HDR is good, but not perfect...take a look, the issues are very evident. I also placed a GoPro timelapse of the shooting process online, so you can watch that too. Make the jump to go through the online gallery, I ask that you leave comments/criticism or at least give your favorites a thumbs up...Thanks! If you have questions, ask. I published the camera information with each image and have added full keywords to share just about anything you would want to know about the images. p.s. I'll be sure to share the video if/when it is all finished. p.p.s. The old BLM map I have calls the canyon "Pictograph Canyon" although it is filled with petroglyphs. A high dynamic range technique can be really useful in reproducing a greater dynamic range of luminosity. That is why everyone should get to know it better, I recommend this website to get more information.